How Vapid And Racist And Cloistered Is The American Media, Really? Tragedies—like yesterday’s terrorist attack in Brussels—deserve and receive immediate international media attention. In America, we dedicate a particularly breathless, all-encompassing sort of coverage to violent news out of Western European countries. To put it another way: white people suffering gets Americans talking. If you’re paying attention to the news cycle, you know there’s certainly some merit to this critique—but just how much merit? Jigsaw—a “technology incubator” that started out as a Google think tank—addresses this issue in a new interactive map they’re developing. 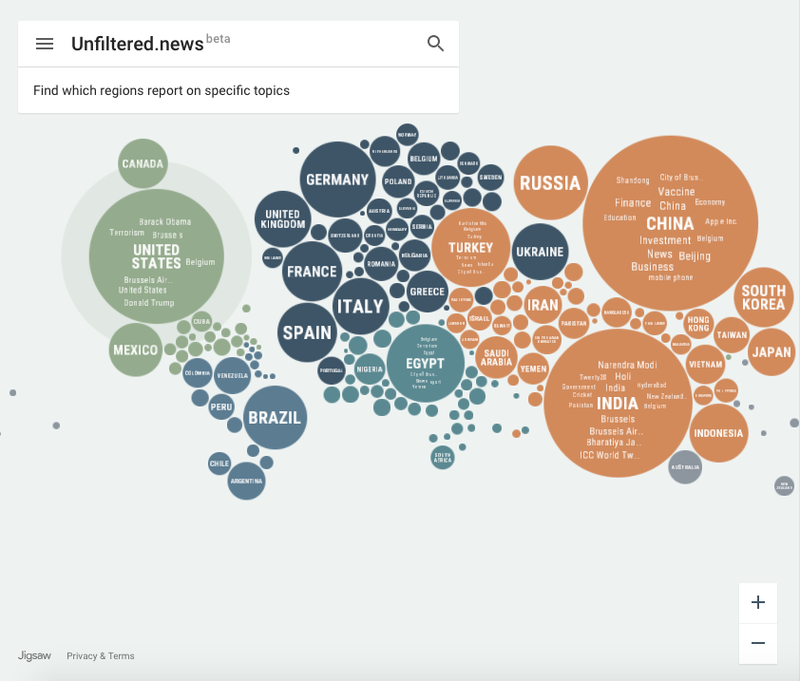 Unfiltered.news (currently in a beta version) tracks which “globally popular topics” are not being reported locally—however you want to define that word. The data is mined from Google News—including all languages and locations—and organized into the top 100 topics for each country. Within a particular country’s bubble, the font size of a topic gives a relative sense of how popular it is. But crucially, a sidebar shows key words for topics that are popular globally, but don’t crack the top 100 in that selected country. Today, then, we see the American media reporting heavily on “Brussels,” “Belgium,” “Brussels Airport” (as well as “Rob Ford,” “Batman,” and “Spring”), but not “Egypt,” “Ukraine,” or “Turkey”—all of which are popular globally. The timing of this is not exactly fair. Toggle back to the Sunday stats—the day after the attack in Turkey—and “Istanbul” appears in the U.S. bubble (about equal with “Donald Trump” and “National Collegiate Athletic Association”). However, “Istiklal Avenue,” where the bombing took place, is missing from the U.S., but near the top of the list globally. It’s not a perfect measure of American media blindspots—and it’s not explicitly intended to be. But if you’re curious about overcoming any nationalistic reporting biases, the map allows you to get a broader picture of the news. Just click on a “less reported” topic to see a selection of handily translated headlines, and become a better global citizen.